The US-bound migrant caravan that has so angered US President Donald Trump has decided to resume its trek north after resting in Mexico City for nearly a week and failing to secure buses for the journey. In a sports arena turned into a makeshift shelter, a vote was held yesterday mainly among male travellers and the verdict was to keep going and leave at dawn. The group of some 5,500 people, most of them Hondurans, began arriving in the Mexican capital on Sunday. They have been traveling since 13 October, mainly on foot, and covered more than 1,500km, but are still weeks away from the US border. Most of them are fleeing grinding poverty and violence from powerful street gangs. On some stretches of the trip, some of the migrants have been riding on trucks. However, one person fell off and died when the group was in Chiapas state in the south. Since then, Mexican police accompanying the caravan have barred the travelers from hanging off the side of such trucks. Two other caravans with about 2,000 people each are making their way through southern Mexico. Calling the caravan a "national emergency," Mr Trump has threatened to deploy as many as 15,000 troops to the border with Mexico. Some 4,800 had been deployed as of Monday, the Pentagon said. The United States will no longer allow people who enter the country illegally to claim asylum, officials have said as a controversial new crackdown on immigration was announced. The new rule published by the Department of Homeland Security is expected to get President Trump's signature shortly, as well as face court challenges. But according to the new rule, Mr Trump has authority to restrict illegal immigration "if he determines it to be in the national interest". The Trump administration argues that he has the executive power to curb immigration in the name of national security. It is a power he invoked right after taking office with a controversial ban on travellers from several mostly Muslim countries, whose final version was upheld by the US Supreme Court on 26 June. 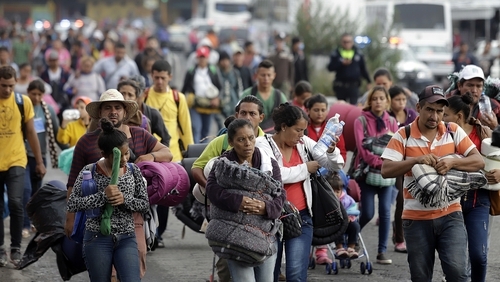 Those seeking political or other kinds of asylum, nearly all of them coming from impoverished and violent crime-plagued countries of Central America, will be heard exclusively at the border crossings, administration officials told journalists. Many politicians on both sides of the aisle agree that the US immigration system is hugely inefficient and unable to cope with demand. However, Mr Trump's focus on the issue during campaigning for Tuesday's hotly contested midterm congressional elections was criticised as veering into immigrant-bashing and even racism. He called the current caravan an "invasion" and said it would bring hardened criminals to US streets. Administration officials say that aside from the rhetoric the border does have a problem, given that anyone who manages to get across can request asylum and often vanish while their case sits in the court system. Less than 10% of cases result in asylum being granted, the government says. Human rights campaigners and other critics of the Trump crackdown say that by restricting asylum seekers to the narrow border crossing points, which are already under enormous pressure, the government is effectively shutting the door on people who may truly be fleeing for their lives. But the administration official argued that "what we're attempting to do is trying to funnel credible fear claims, or asylum claims, through the ports of entry where we are better resourced". In 2018, border patrols have registered more than 400,000 illegal border crossings, homeland security said. It said the number of those requesting asylum has increased by 2,000% in the last five years.